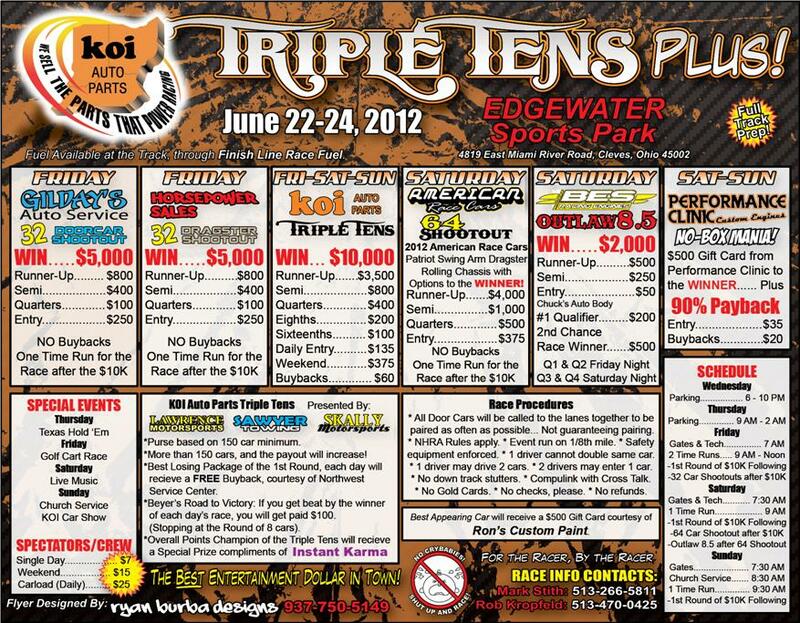 Cleves, OH - Big Bucks Bracket Racing Returns to Edgewater Sports Park this weekend in the form of the Inaugural Triple Tens Plus! Friday, Saturday and Sunday all see a host of Big Bucks Races, Shootouts and Specialty Races. Parking available on Wednesday and Thursday with time runs beginning Friday at 9am. 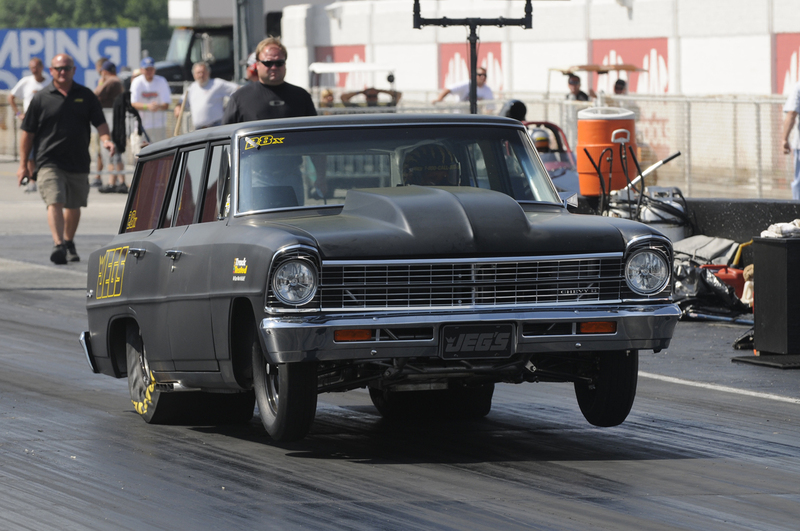 Cleves, OH - For all of his great success in drag racing, including 67 national event victories and five world championships, Jeg Coughlin never experienced a day like the one he enjoyed Sunday at the Ultimate 64 Shootout at Edgewater Sports Park. 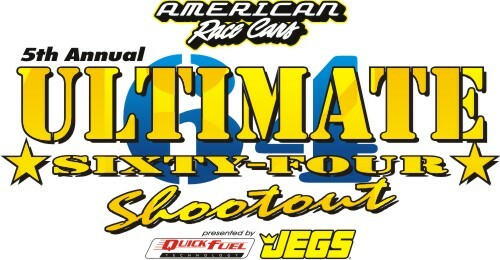 Cleves, OH - The highlight of the Ultimate 64 Shootout will be Saturday's main event which pays $50,000 to the winner. There will also be three separate $10,000-to-win races and three "second chance" events to go along with a $12,000-to-win high roller event on Friday night. Cleves, OH - In addition to an immense purse of over $200,000, the event features a myriad of fun-filled events and activities. The following is a breakdown of what to expect on a daily basis from this years Ultimate 64 Shootout. 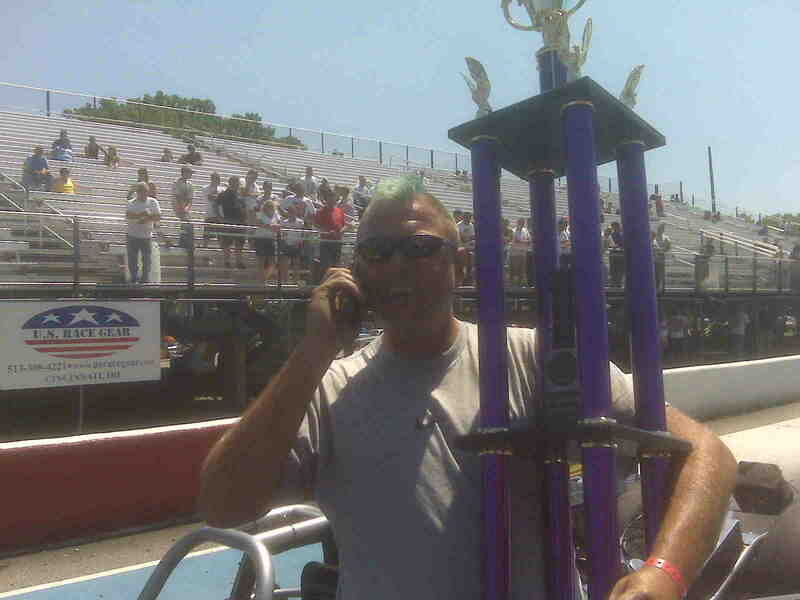 Cleves, OH - The sixth annual American Race Cars Ultimate 64 Shootout presented by JEGS will come to Edgewater Sports Park on June 10-12. 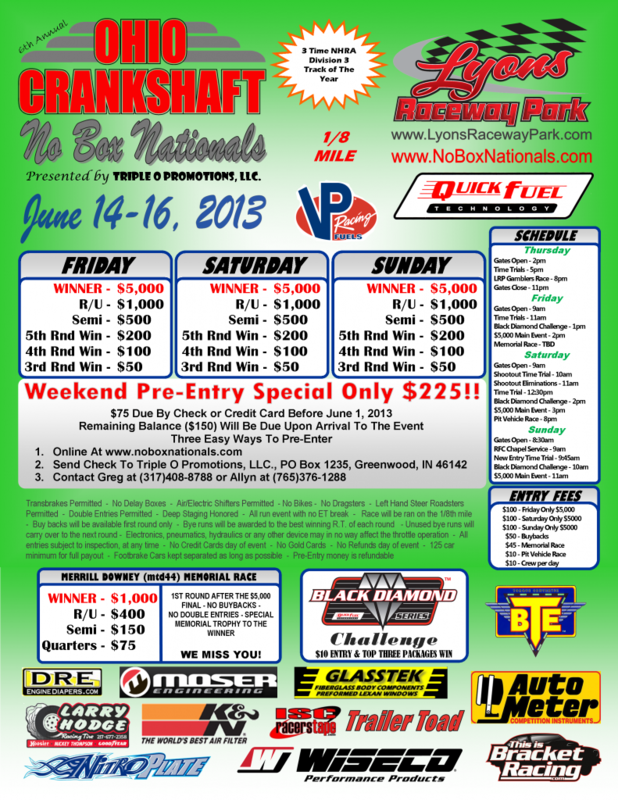 The weekend will once again be highlighted by the Ultimate 64 Shootout main event; a pre-entry, 64-car field featuring a whopping $50,000-to-win. 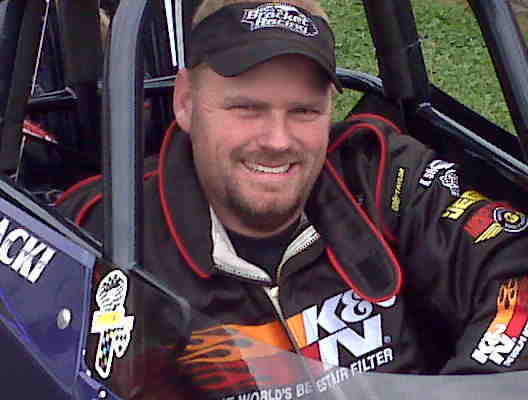 Cleves, OH - Luke Bogacki drove his ThisIsBracketRacing.com backed American Race Cars Dragster to a pair of final round appearances last Saturday at the 5th Annual Ultimate 64 Shootout held at Edgewater Sports Park near Cincinnati, OH. 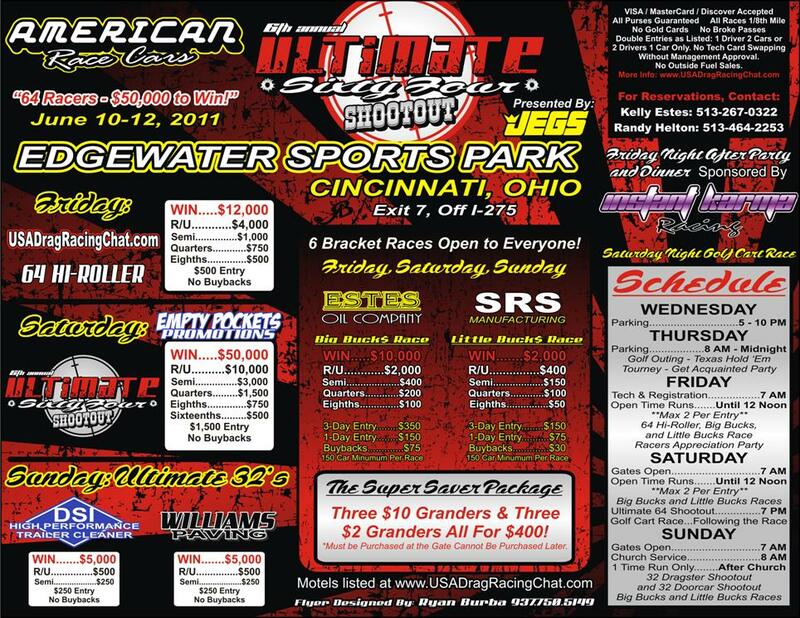 Cleves, OH - The 5th annual American Race Cars Ultimate 64 Shootout presented by JEGS and Quickfuel Technologies is back and promises to be better than ever at Edgewater Sports Park this weekend. Cincinnati, OH - The event, which hosted a marathon weekend full of big dollar competition saw Tennessee's Jason Lynch claim his 3rd $50,000 triumph. Cleves, OH - Jason Lynch tops a "Star Studded" field of Bracket Racers to win The Ultimate 64 at Edgewater Sports Park over Troy Williams Jr.